← “You’re entirely bonkers. But I’ll tell you a secret. All the best people are”. When the invitation arrived for my cousins wedding in South Africa I instantly got that excited feeling that we all get for soon-to-be weds, and overseas adventures, and even though a South African trip was not written into the financial plan, I’m a huge believer in the power of the positive. We do everything we can do to make things happen and when they are meant to be, they happen; so against most odds, this Milliner has just been on the Move to South Africa. The feat is never easy coordinating family and friends from around the world to the one place, let alone when the destination is in severe and declared drought and even without a President for a day, but despite these challenges and sadly, more, Simon and Becky brought us all together for the most beautiful celebration of marriage; an intimate affair with the size of crowd that fits everyone on the dance floor. And Africa was indeed the perfect destination, filled with adventure, rhythm, colour and fun; and as long as you are aware of your surroundings and confident in your stride, you can breathe the air of a frontier land; not that dissimilar to the Kimberley. The animals of course, are completely different! The African animals are something else, they are so huge and elegant; scary but not; I was like a kid let out of their seat belt on safari. Bouncing from one side of the mini bus to the other, which is perfectly OK when you are the only passenger on the tour (winner)! And the jungle put on a show. My guide was concerned if the animals would be out because the weather was clouding over and starting to sprinkle rain, however, I just knew they would be there and simply thought it would be brilliant if it rained on Africa. I’d arrived into the country from record rainfall and a flooded Broome, I would have loved to have brought the rain to drought stricken South Africa, but they were in fact after a tad more than the 4mls that fell when I was there. I grew up in drought country with the one minute showers, so the water saving requests of the Cape were familiar, however, to be in a city of around 3.8 million with the taps turned off was confronting. Most washrooms had no water and instead offered mostly empty bottles of sanitiser. Tap water was reluctantly or not offered at all in restaurants and the park lawns were brown, waterfalls turned off, and bottled water disappeared off the shelves as quick as it was stacked. Lucky there was lots of wine! Yes, along with the animals, South Africa boasts many a magnificent drop, so with the country’s best interest in mind, we shifted the fluid intake to wine. And getting out into the wine country was stunning. The sheer beauty of the countryside was awesome with majestic mountain ranges smoothing into the perfect grape lines of vineyards. I was wrapped in inspiration from morning till night throughout the whole South African adventure. The flora, the animals, even the drought filled me with inspiration, not to mention the romance of a garden wedding in a winery estate, and the happiness that is family and friends brought together; the safari too, I was so inspired by the animals, their colours, their sounds, even their stance, the way the elephant crossed her back legs; I was blown away how such an enormous animal could appear so stylish; and the graceful giraffes… with every animal and bird and flower the smile grew bigger. 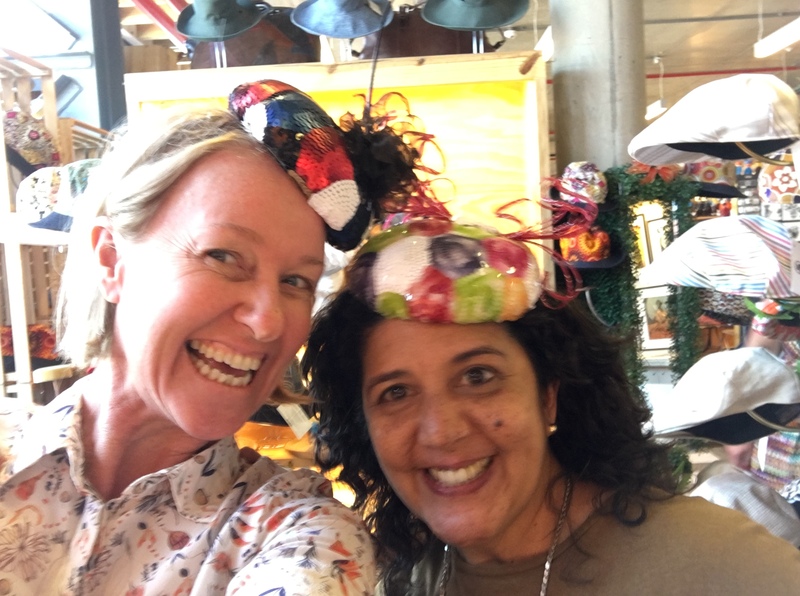 I sketched, photographed and recorded – I couldn’t stop – everything around me fuelled the creativity – and while there may have been little water, South Africa fed this milliner with inspiration to create; … which is handy given I have a Sydney exhibition in a little over a week! 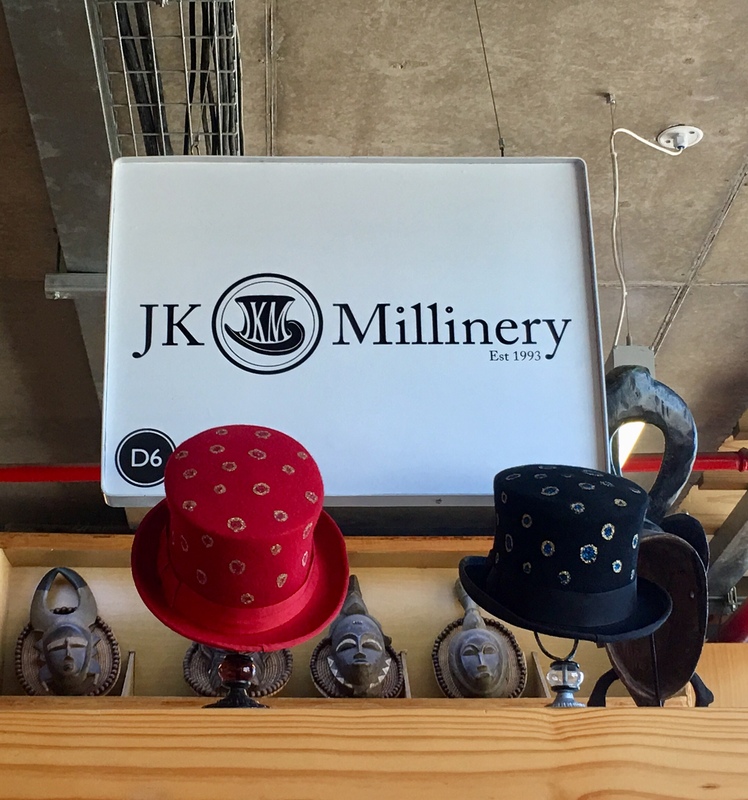 And then there was the highlight of spending time with Cape Town Milliner Jacqueline Kolbe of JK Millinery. Jackie and I spent hours comparing stories, creations, highlights and challenges. We bounced ideas, inspiration and future plans. I love meeting fellow milliners who share the passion of our art and can’t thank Jackie enough for the catchup. I could sit and talk about South Africa for hours, instead I’m going to head back to the studio and my self imposed millinery lockdown to create this collection. And as I prepare the next design, I take a moment to acknowledge the beauty of Africa and the importance of travel and of the gathering of family and friends; and most importantly, I want to shout out a huge “thank you” to Simon and Becky. If you are in or near Sydney on Friday 16th March and would like to come along to the Exhibition, I would be thrilled to have you there. Details are on the Facebook Event page “Get a Feather in your Hat – Broome to Balmain” and don’t forget to click the RSVP so we know you’re coming along. And if you would like an insight into the inspiration that creates the collection, with the greatest pleasure I invite you to subscribe to my YouTube Channel “Milliner on the Move”, where I am about to unveil the first video that will take you a step before the creation, even before the preparation of the feathers; I am going to show you the inspiration as I see it from my very own eyes, starting with South Africa. 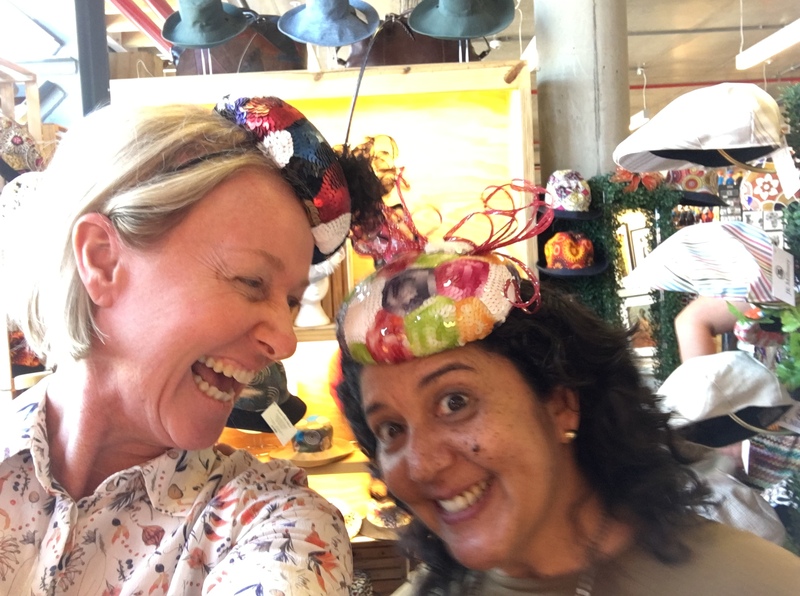 This entry was posted in General, On the move to South Africa - Feb 2018 and tagged Cape Town, Hats by Felicity, JK Millinery, Milliner on the move, South Africa. Bookmark the permalink.